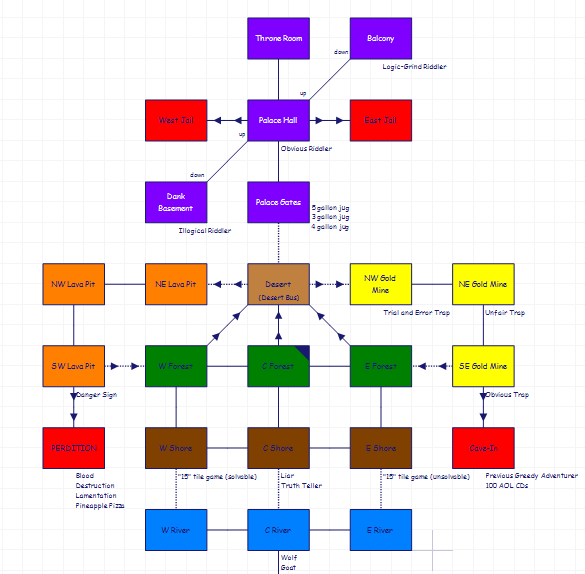 Most of you are at least somewhat familiar with the mapping tool Trizbort, created by Genstein. Back in 2013, on this thread (viewtopic.php?f=38&t=7473) he announced his decision to opensource the code. Then in March 2014, on the same thread, forum user wertle, made some updates (which turned out to be pretty useful) and fixed a few bugs. Then nothing, there seemed to be little movement on new development. This last December, I asked my writing group if they felt there would be interest in making some updates. I received some great encouragement and Andrew Schultz (aschultz) specifically stepped up with some great ideas and feature requests. So work began. 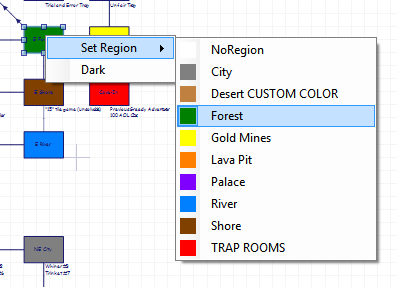 Support for Regions – You can specify room colors in any case, but regions make it easy and allow you to group rooms together. SmartSave – quick shortcut to save PDF & default image type to base directory. Join room – shortcut to join two selected rooms based on position on map. Simply unzip the file to a folder and run the executable (make sure all files included in the zip file are in the executable’s folder). Andrew is currently working on updating the documentation (with the blessing of Genstein) and he has put up a draft at https://www.dropbox.com/s/x85lk5dpkie7d … shtml?dl=0 and is of course open to suggestions to improve the documentation (still working on getting images updated). Again, remember this is beta software. Please let us know of any bugs that you find or features you think will be useful. Inform 7 Gems – Is Transcription On? As I was poking around the forums the other day, I realized how much information is buried in the forums. Things I might not even think to search on or are difficult to find even when looking. And when you do find something, it’s often difficult to piece the useful information together from a long thread. With that in mind, I’m going to start a series of posts, starting with this one, on things I’ve found in the forums or elsewhere that I find interesting or useful and try to put them in nice digestible bites. I hope to educate myself through this process and hopefully they’ll be of use to others as well. My first gem was suggested to me by Andrew Schultz. Back in 2012 he had started a thread entitled I7 – Check if transcripting is on when noting? The basic premise behind the post was checking if transcripting is turned on. As I talked about in my previous post on easy transcription notes, Andrew was doing something similar, but as an added bonus, wanted to check if the transcription was turned on and if so, at a minimum warn the user that it wasn’t turned on. Very useful for beta-testing and I myself often forget to turn on transcription. With some help from zarf and others, what we end up with is pretty useful. ignore-transcript-nag is a truth state that varies. What we have is some I6 code that is checking a flag (different depending on zcode vs glulx) that when the user enters a note command, it checks to see if transcription is on and warns the user if it is not. This will prompt the user to turn on transcription and should work in either zcode or glulx. I seeing more and more that I really need to dive into I6 more to see the possibilities that I may be missing. Edit: changed the regular expression to work around the I7 bug mentioned in the comments.